[0:01] <wondiws> is there a way to just output a PWM signal with raspi-gpio? I can put the pin in question in alt-5, for PWM, but how do I enter a frequency? [0:24] <rwb> Trying to understand i2c, I have 2 hats stacked. PiJuice, and Sense Hat. when I run i2cdetect, I see just numbers where the UU's were when I didn't stack them. the PiJuice is at 68, and the sense is at 46. [0:25] <wondiws> rwb, what does UU stand for? [0:25] <rwb> I don't know. [0:26] <rwb> when I stack them, I get error on the sense hat scripts. "Cannot detect RPI-sense"
[0:27] <rwb> How can I get the sense hat to work? [0:27] <wondiws> ebarch, rwb oh, UU is just there's nothing at that slot? [0:28] <rwb> all the led's are lit up, but I get python errors, 'Cannot detect %s device %s self.SENSE_HAT_FB_NAME' Ahh. Not sure what I'm doing. [0:28] <rwb> w/o the pi juice stacked under it, it works fine. [0:28] <wondiws> rwb, oh, wait, you do get 68 and 46 when you do i2cdetect? [0:29] <ebarch> "HATS have to have an EEPROM that automatically configures them. That mechanism does not support stacking and will just fail if you try it. " [0:29] <rwb> Ahh, why the stacking header then? There must be a way right? [0:29] <ebarch> "Hats, by specification, are NOT designed to stack." [0:30] <ebarch> "If your cards don't have the EEPROM (and therefore can't call themselves a HAT) and you configure them manually, then you may be able to stack them." [0:30] <rwb> OK, so you can always only have 1 HAT device on a pi and thats it? Nothing else? I'm reading that it can be done, but cannot find a way. [0:30] <rwb> they do have eeproms. [0:31] <rwb> do I need to flash my hats? [0:32] <rwb> Do I need to re-program my hats eeproms? [0:49] <rwb> ebarch: Thanks for the links. After a quick read, this is where I'm falling down "If you do buy genuine HATs, then you may be able to manually configure the cards instead of the automatic mechanism, but it'll be a little more involved." How do I manually configure the hats? [0:51] <rwb> I guess I need to reprogram the eeproms and flash them? If I do that, with the RPi itself freak out? [0:58] <ebarch> wish i could be more help. would love to hear what you learn! [1:35] <mlelstv> a cable and a USB/Serial converter ? [5:27] <kzisme> is there a good way to see what is taking up all the disk space on my pi? [5:48] <kzisme> any ideas on how to fix? [6:07] <kzisme> HrdwrBoB: It's it installed by default? [6:08] <kzisme> The filesystem is already 716800 (4k) blocks long. Nothing to do! [9:41] <Li> can anyone tell, how to connect and read data from RS232 port of PLC from raspberry pi 3? [9:59] <Li> davr0s: what is the brand/model of that mentioned camera? available on Amazon? [9:59] <Li> why don't you buy it and use with rPi? [10:00] <Li> goPro alike you mean? [10:07] <Smeef> I seem to be having problems getting NTSC/PAL output from a fresh copy of NOOBS 2.8, can anyone confirm that the hotkeys (1,2,3,4) to switch between video outputs work the same in the latest version of NOOBS? [11:49] <andrei-n> Hello. Do you know whether it is possible to buy an electronic paper display? I'd like something not too small (on ebay I only see max 4.3 inch displays...). Thanks. [11:50] <MacGeek> waveshare offers up to 7.5"
[11:59] <andrei-n> MacGeek, Thanks a lot. [13:06] <shiftplusone> Li: any luck? [13:47] <roxlu> hi! I want to compile some code that calls OMX_Init() but OMX_Init() returns OMX_ErrorHardware. I googled and I saw that I can change my memory split via raspi-config to 128, but that didn't do the trick. Someone around who had a similar issue? [13:51] <Alina-malina> is it a good practice to use old desktop ATX PSU as RPI3 power supply? [13:55] <mfa298> Alina-malina: not sure I'd call it best practice, but several people seem to do that. [13:57] <mfa298> what's the best approach may depend on where the Pis are located. If there's some seperation (1m+) then seperate PSUs is probably easier and fewer potential problems. [14:13] <shiftplusone> gartral: how much is the postage? [14:15] <shiftplusone> strange. The reviews don't seem to suggest it's an outright scam. [14:18] <pksato> free international postage from USA? [15:03] <shiftplusone> That was not a proud moment for anybody involved. [15:10] <HrdwrBoB> then.... lots more code. [15:36] <argoneus> but I'm 100% sure it says AD and not A0... is this just a labelling mistake? [15:48] <red9> Wire up a digital oscilloscope to the AD + A0 connections. Then trigger the smoke alarm and record what the output signal(s) are. [15:53] <red9> I'll guess the datasheet is unavailable. Otherwise this question shouldn't be needed. [15:57] <shiftplusone> "With DO switch signal (TTL) output and AO analog signal output"
[15:58] <shiftplusone> "Analog output voltage: 0~5V, the higher concentration, the higher voltage"
[16:04] <mfa298> Alina-malina: with fans and 3.5" HDD in a single case than an old ATX psu is potentially a reasonable way to go, with the fans and hdd you might get enough load to keep things stable. [16:06] <Apocx_> Yeah it depends on your particular PSU but it has been done before, many times. [16:16] <pksato> can be is possible if HD is a IDE and using PIO mode. At very low data speed. But, is more easy to use one of pi to share hdd . 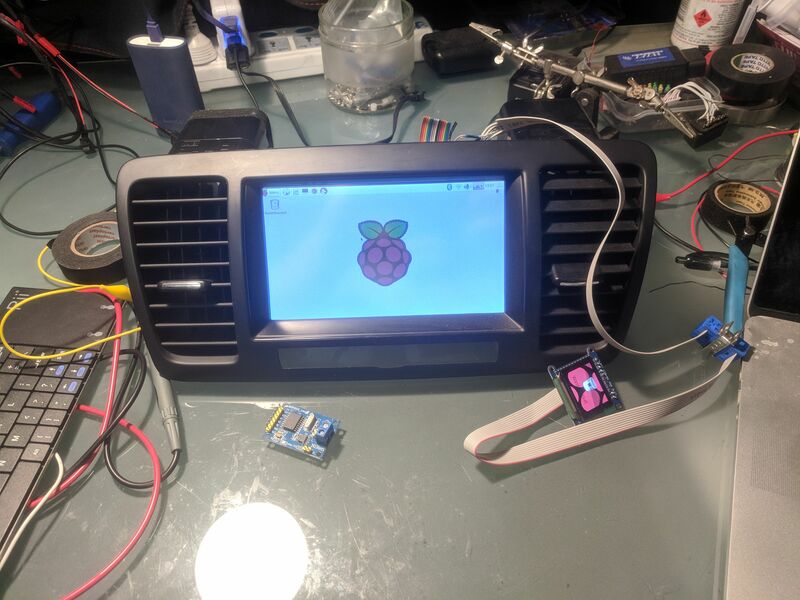 [16:19] <pksato> some one done the inverse: This project aims to design and build a complete parallel ATA (PATA) IDE disk emulator from an inexpensive Raspberry Pi Zero. [16:22] <shiftplusone> I also knew somebody who was working on getting the pi talking to an IDE drive via SMI, but they gave up in the end. [16:22] <shiftplusone> Not sure if it was because they ran out of time or if they found it wasn't possible. [16:26] <shiftplusone> Fast storage without sacrificing USB bandwidth, I guess. [16:28] <Apocx_> I stopped using IDE drives like 8-10 years ago so I guess I just never noticed. [16:29] <Alina-malina> so i need like microUSB to SATA cable then? [16:29] <audiofile> hi, how can I start kodi's web server on a headless pi? [16:30] <mfa298> but in general only connect a single HDD to a single computer and share over the network or you'll have many interesting issues. [16:33] <mumixam> anyone using a asus nano ac53 for wifi? [18:55] <argoneus> is it possible to fry anything by accidentally swapping MISO/MOSI or such? [18:59] <shiftplusone> If you connect two output while one is high and the other low, yeah. [19:26] <argoneus> I assume that's MISO? [19:31] <fooman2011> Hello. I'm looking for help about omxplayer. I would like to play a stream using omxplayer. My problem is that whatever the used solution (http stream, fifo pipe, ...) omxplayer always exit when no data is available from the stream. Could you please tell me if there is a way to tell to omxplayer to block, waiting for more data, then resume ? [23:21] <Trel> Oooh, did the RPi team ever give an ETA on the PoE Hat?